A gang of dancers clad in all black moved seamlessly across the stage. Another gang in striped patchwork onesies aggressively tried to gain ground and takeover the space. Meanwhile surveillance cameras watched their every move and projected the images onto a screen at the back of the stage. There was never a dull moment in this cinematic show featuring seven dancers in constant motion. Co-Artistic Directors and choreographers David Raymond and Tiffany Tregarthen have created a multi-layered work that brims with urgency and an ominous tone. The theme of surveillance is very prominent as the camera moves to follow the dancers’ movements and they are being watched from every angle. All seven of these dancers had a wonderful depth and range, and this choreography is especially good at showing off their facial expressions. Every part of the body is involved, and it’s nice to see the face being used so integrally here. The choreography also integrates many animalistic qualities, with one moment standing out for me when the dancers huddled together to create a face using their arms. With masterful lighting, the skin of their arms stood out against their black outfits, and as their arms moved, the face spoke and we heard a gruff, sinister voice to accompany it. This small scene was very effective in creating a powerful optical effect with the body, and also continued the ominous, uncertain tone that ran throughout the piece. Thinking back on the show with the theme of surveillance in mind, the opening monologue seems more apt. One of the dancers stood at the front left corner of the stage repeating phrases like “this is good,” “this is good for you,” and “this is you” that seem to emulate the way surveillance is justified in society. The projections, sometimes shown in slow motion or one frame at a time, added just enough depth to the work and weren’t overpowering or distracting. With the two distinct groups fighting over the use of the space, the choreography remained aggressive and powerful for most of the show, although the two groups had different styles. It was also impressive the amount of times the dancers had to change in and out of costume to represent each of the groups. The group in all black danced to orchestral music that swelled beautifully and was quite uplifting. A bit of Charlie Chaplin influence could be seen in their movements. The other striped group were accompanied by harsher sounds — base heavy electronic music. They seemed to be represented as the bad guys with full face masks and one member who wrote “Leave them in the dark” in graffiti on the back wall. Apart from the animal face made of arms, I also loved one ominous character that reappeared many times throughout: a giant grey button down coat with three sets of legs and no head. This creature moved awkwardly about the stage and at one point even consumed one of the dancers. 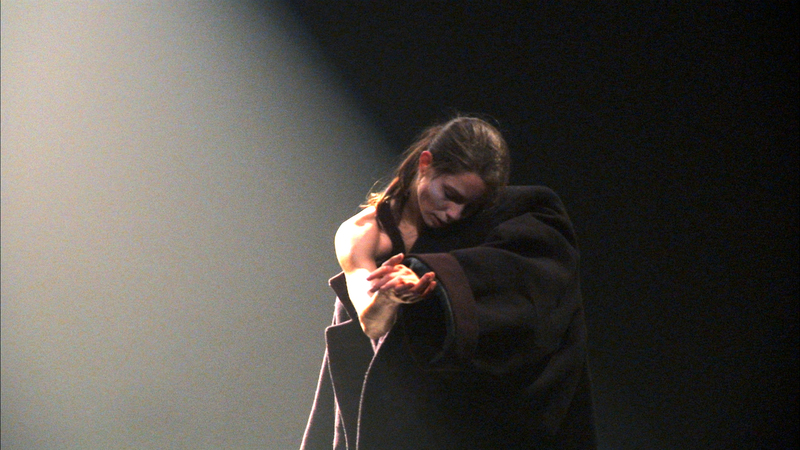 The final scene involved the coat, but this time with only one other dancer, Tiffany Tregarthen. This was the best scene, her duet with the coat. She masterfully danced with the coat to make it seem as if she was dancing with another person. It could have leaned towards the humorous side, but it was an emotional, nuanced performance that capped of the show very well and left us able to contemplate the large themes and questions raised by the choreography.